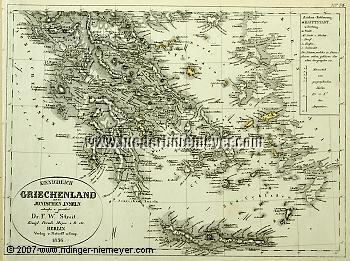 Greece and the Ionian Islands, Kingdom of. With cartouche for title, miles indicator, and list of conventional signs. Map by Friedrich Wilhelm Streit (Ronneburg, Thuringia, 1772 – Berlin 1839) colored in outline. Steel engraving. 1836. 9 × 12⅛ in (22.7 × 30.9 cm). – With Crete. – For Watteau’s Cythera Group see Ridinger’s The Cythera Lady.